Best grown in moist, organically rich, well-drained soils in full sun to part shade. Tolerates average garden soils. Avoid heavy clays. Prompt removal of root suckers will help maintain plant appearance, and, if desired, help prevent thicket formation. 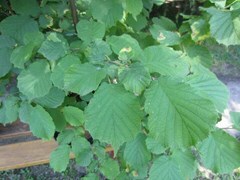 Plants may be propagated by suckers, early summer soft wood cuttings or seed. Corylus avellana, commonly called European filbert, European hazelnut or cobnut, is a deciduous, thicket-forming, multi-trunked, suckering shrub that typically grows to 12-20’ tall. It is native to Europe, western Asia and northern Africa where it is typically found growing in rich thickets, woodland borders, wooded slopes, hedgerows, clearings and along streams. Monoecious flowers (separate male and female flowers on the same plant) bloom on bare branches in late winter to early spring (March-April) before the leaves emerge. Somewhat showy, pale yellow-gray male flowers appear in sessile drooping catkins (each to 2-3” long). Inconspicuous female flowers with red stigmas bloom just above the male catkins. Double serrate, elliptic to ovate to orbicular, medium green leaves (to 4” long) are rounded to cordate at the base and generally hairy. Leaves turn variable but often unexceptional shades of yellow in fall. Smooth light bark is gray-brown. Fruit is a hard edible brown nut (to 3/4” long) enclosed in a leafy, hairy, light green husk. Nuts are known as cobnuts. Nuts appear in terminal clusters of 1-4 and are half covered in ragged husks. The husk (involucral tube) surrounding the nut extends beyond the nut by at least one inch to form a beak. Nuts ripen in late August and September. In Europe, cultivars of this shrub are commercially grown for nut production. Numerous cultivars exist. In the U.S., Oregon is the center for nut production. The nuts from species plants may be roasted and eaten, but are less tasty than those found on developed cultivars and are usually left for the squirrels. Specific epithet comes from Avella Veccia (southern Italy) or of Avellino (city east of Naples where this plant was much cultivated and called nux Avellana by the Romans). Common names of filbert and hazelnut are likely interchangeable. Hazelnut is more often used in reference to wild specimens and filbert is more likely to be used in reference to cultivated plants. The filbert nuts produced in commerce primarily come from hybrid plants (C. avellana x C. maxima). Reportedly has good resistance to filbert blight. Infrequent disease problems include black knot, crown gall, apple mosaic virus, and leaf spot. Scale may occur. Japanese beetles may vigorously attack the foliage in some areas. Straight species is effective in naturalized areas, group plantings, shrub borders or woodland margins.